This apartment is in the Rincon Hill neighborhood in San Francisco. Nearby parks include Emerald Park, Rincon Hill Dog Park and South Park. 340 Fremont Apartments has a Walk Score of 92 out of 100. This location is a Walker’s Paradise so daily errands do not require a car. 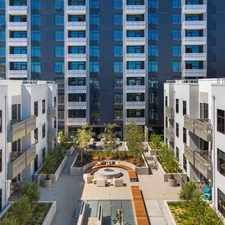 340 Fremont Apartments is an exclusive, brand new apartment community, unmatched in the city of San Francisco. Designed by the world-renowned Handel Architects, this 40-story tower is a crisp new addition to the city skyline and represents the ultimate in luxury urban living. 340 Fremont is punctuated by inspiring design themes and amenities. Interior tones purposefully evoke California living, from wine country to the coast. The 24-hour concierge, rooftop terrace, intimate resident lounges and state-of-the art fitness center deliver a resort-level experience commensurate with luxury urban living. Located in the rapidly emerging The East Cut neighborhood, 340 Fremont residents are steps away from the Embarcadero, Financial District and South Beach, and have direct freeway access to the Bay Bridge and Silicon Valley. Explore how far you can travel by car, bus, bike and foot from 340 Fremont Apartments. 340 Fremont Apartments is a Rider’s Paradise which means world-class public transportation. Car sharing is available from Zipcar, RelayRides, City CarShare and Getaround. 350 Fremont St compared to all of San Francisco. How do you feel walking near 350 Fremont St? View all Rincon Hill apartments on a map. 340 Fremont Apartments is in the Rincon Hill neighborhood. Rincon Hill is the 53rd most walkable neighborhood in San Francisco with a neighborhood Walk Score of 88.